MidTown has a new coffee shop and locals are enjoying a cup of Joe in a friendly, artsy atmosphere. JoStella Coffee Company, formerly Dreamers Coffee House, is family owned and operated in the heart of MidTown. Dreamers Coffee House was purchased in August 2017, and the Sisson’s quickly went to work remodeling the 1200 sq. foot space, located at South Virginia and Saint Lawrence, in the very heart of MidTown. "I always wanted to own a coffee shop," said Tammy. "I love it." Tammy, Kayla, and Paul Sisson at JoStella. For Tammy Sisson, JoStella is an encore career, a new venture in the second half of her life. 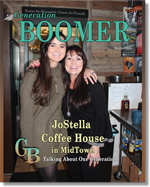 "Boomers and seniors are regulars at JoStella," Tammy says. "It is a good local crowd." She is having the best time of her life. Just turning 50, JoStella is also an exciting change from a longstanding career providing care to the elderly and people with disabilities. Tammy is the owner of LendAHand Senior Services, a personal care agency in Reno. Tammy and husband Paul Sisson have been providing caregiving services to families over 25years. LendAHand, just like JoStella, is a family operated business. Tammy will still be involved in LendAHand, but in January 2018, Ky Sisson, Tammy’s son will be running the company. Ky’s coming onboard LendAHand is maintaining a long history of family working together. 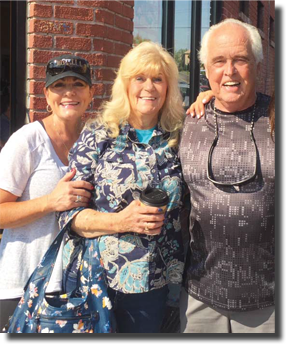 Tammy and her parents, Joseph and Genny, started LendAHand together in 1992. Joseph and Genny continued to work until they retired. 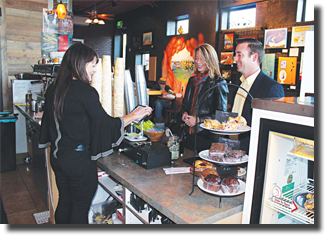 Tammy Sisson works with patrons ordering coffee. 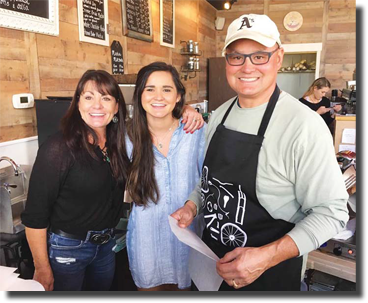 JoStella Coffee Company is named after Joseph, who is fighting brain cancer. Tammy says, "It was Kayla’s idea to name the business after her Papa." Kayla, a college student majoring in business management, also designed the company’s logo as well. She will be graduating this May from UNR. Tammy, Genny, and Joseph Stella. JoStella is named in honor of Joseph. JoStella Coffee Company specializes in coffee, tea, and a variety of special drinks including smoothies and milk shakes. Pastry and Danish are served along with deli sandwiches and croissants. Products sold at JoStella come from local vendors, such as Davidson’s Tea in Sparks, Rounds Bakery in Reno and Dish Café and Catering Company, Reno. 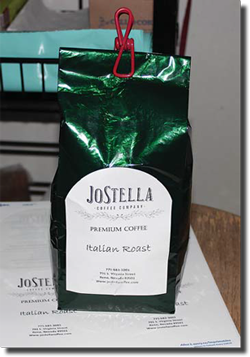 The coffee is made locally and branded with the JoStella company name. Coffees served include a cold brew, the Americano, Cappuccino, mocha, latte, and more. JoStella has been remodeled and artwork created by local artists is displayed in the lounge where customers can relax and enjoy the MidTown atmosphere. JoStella is located at 701 S. Virginia Street, Reno, NV 89501 in the Saint Lawrence Commons. 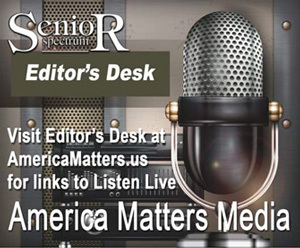 Hours are 7 a.m. to 6 p.m., seven days a week. The Sisson’s can be reached by calling 775-683-3003 or visiting www.jostellacoffee.com.